Just as there are two sides to every story, there are also two sides to every man, and the city in which he lives. Inspired by this idea, menswear brand Remus Uomo’s AW17 campaign focuses on the versatility of the modern man’s style and of its latest collection. Titled ‘Parallels’, the short film stars up-and-coming English actor James Farrar (Silent Witness, Call The Midwife) as he gets dressed for two very different sides of a metropolis. Alongside slick wool tailoring for the upscale part of the city, the award-winning brand also pulls on the sports-luxe trend, with pieces designed for the casual downtown area; both of which work together to create contemporary layered look. Everything from the timeless two-pieces and stretch material shirting to jersey outerwear and drawstring trousers is tied together using innovative fabrics such as printed wool, and a masculine colour palette comprising navy, grey, claret and forest green. The campaign was shot in and is inspired by Dublin, a European capital booming once again thanks to the investment of global technology and finance brands. The influx of investment comes after a prolonged period of difficulty following the catastrophic financial collapse of the country, creating a unique dual aspect to the city’s character. It’s also the home of Remus Uomo’s newly expanded flagship. Located in a former coach house at one of Dublin’s most iconic addresses – St Stephen’s Green – it comes ahead of another store due to open in the Midlands in mid-November. The revamped retail space brings together each aspect of the collection into a single Instagram-baiting interior complete with custom designed lighting, furniture and sound system. The navy suit jacket is a key element of every man’s wardrobe. Cut slim for a flattering fit and available with matching elasticated waist trousers, this wool-blend version is ideal for creating a stylish business-casual look. This season’s selection of fine gauge knits makes it possible to look smart without ever fully suiting up. Spun from a soft handle Merino wool-blend, this crew neck sweater will give off an attractively relaxed impression. Make a sartorial statement without straying into the ludicrous with this subtly textured slim fit shirt, which features a geometric jacquard design to the inside of the classic pointed collar and cuffs. Contemporary staples don’t get more versatile than wool trousers. This pair, is a natty shade of grey and finished with neatly pressed creases, is cut slim for a fit that will rival even your most comfortable pair of joggers. 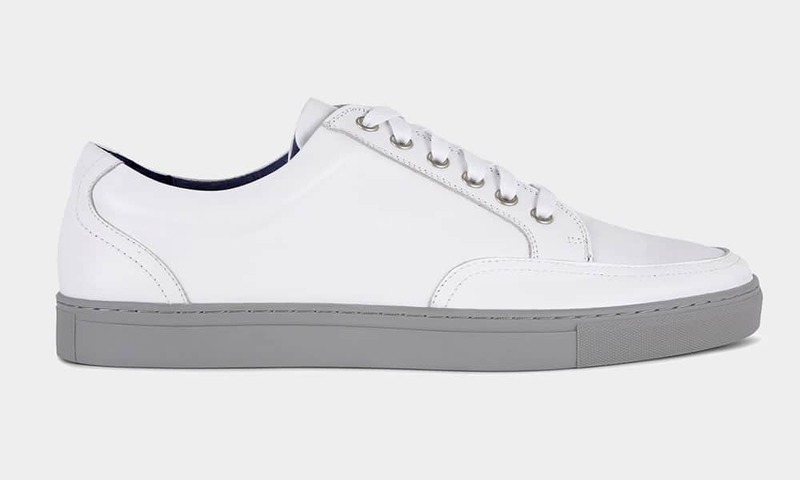 With every man’s wardrobe flooded with minimalist white kicks, stand out by paying attention to the smaller details. This pair sits on top of a contrast grey sole, which helpfully helps them stay looking box fresh for longer. To shop the full AW17 collection, visit RemusUomo.com.